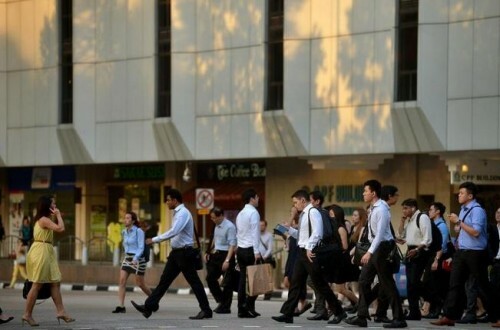 SINGAPORE - Firms looking to hire foreign professionals will soon come under tougher hiring rules, while those prepared to fill their professional, managerial and executive (PME) vacancies with unemployed locals will get financial help to offset their wage cost. From Oct 1, firms will have to disclose the salary ranges of their PME jobs when they advertise their vacancies in the government-run national jobs bank. This will ensure that there is transparency and accountability in the hiring process so that locals will not be shortchanged, said Manpower Minister Lim Swee Say on Wednesday. When these firms subsequently apply for foreigners to fill the vacancies after they cannot find locals, some may be singled out by the Manpower Ministry (MOM) to give information such as whether locals applied for the jobs and how many were interviewed. This will put firms under "greater scrutiny", Mr Lim said. And those who already have a higher ratio of foreign staff, compared to their peers in the industry, will be asked by the MOM to implement a plan to reduce their reliance on foreign PMEs, before the ministry approves new or renew the Employment Passes of the foreigners. But firms will not just face the stick when they try to hire foreign PMEs. Carrots will also be dangled to coax them to give unemployed locals a shot at the jobs. Those who hire unemployed locals for PME jobs that pay at least $4,000 a month can get wage subsidies of between $400 and $2,800 each month for 12 months, to lower their costs of hiring these workers. The wage subsidy programme will run for two years from Oct 1. Besides the wage subsidy, the Singapore Workforce Development Agency is also looking into hiring professional headhunters to help unemployed PMEs find jobs.